Occurrence: In foods such as bagels and as garnishes, tahini, humous. Sesame (Sesamum indicum) is an oil seed plant of the family of Pedaliaceae, originating in India and cultivated in Africa, Asia, the Balkans, the Middle East, Latin America and USA. It includes four species of which Sesamum indicum is the most important found in commerce. The seeds contain approximately 50% oil, used for cooking, and salad dressings. In recent years the worldwide production and consumption of Sesame seeds has tremendously increased. Sesame seeds are consumed as whole seeds or are used in food industry for the production of Sesame paste and oil. Common foods containing Sesame are Middle Eastern dishes, dips, salad dressing, vegetarian foods, Turkish halvah, tahini (ground Sesame seed, tehina), fast food confections, and various bakery products. Furthermore, Sesame oil has been used in the pharmaceutical and cosmetic industries due to its presumably low antigenicity. Systemic reactions: Primarily presenting anaphylaxis characterized by simultaneous involvement of many organs in various combinations of symptoms including hives (urticaria), lip and eyelid swelling (angioedema ) sneezing, nasal itching, congestion, rhinorrhea, wheezing, cough, tightness of throat, hoarse voice, difficulty in breathing, abdominal pain, unconsciousness, shock with drop of blood pressure. In the systemic reactions can also be included severe reactions like dizziness, drowsiness, chills and collapse as has been reported in patients after ingestion of falafel burger. Symptoms involving skin and mucosa: Facial or generalized redness (“flushing”), hives (urticaria) on smaller or larger parts of the body, swelling of the eyelids, lips or other parts of the face, itching of the eyes or of the skin in general, hayfever symptoms in the eyes and eczema. Respiratory symptoms: Hayfever, asthma, cough, wheeze, or difficulty in breathing. Gastrointestinal symptoms: Itching in the mouth and/or tongue soon after chewing and ingesting (Oral allergy syndrome), abdominal pain, swelling of the tongue, throat, and vocal cord, indigestion, nausea, vomiting, diarrhoea. The onset of the symptoms may occur within a few minutes up to 90 minutes after ingestion of sesame seed flour as it was shown in 7 patients undergoing oral provocation test. In a large series of sesame-allergic infants and young children the most frequent symptoms were from the skin, but about one third had anaphylaxis and less than one tenth had symptoms from the stomach. It was a common finding that most patients had other allergic diseases such as asthma, hayfever, and eczema, and most patients also had a relative with an allergic disease. More than two thirds of the patients also had food allergic reactions to other foods. Doses as low as 100 mg of sesame seeds or sesame flour and 3 ml of sesame oil were capable to elicit reactions in sesame allergic individuals during double-blind, placebo-controlled food challenge (DBPCFC). Most patients, however, reacted to 2–10 grams of sesame seeds or sesame seed flour. Clinically significant cross reactivities have been shown between sesame seed and poppy seed allergens and between sesame seed food and hazelnut and rye grain. In patients with sesame allergy/sensitivity, associated allergy to Brazil nut, almond, walnut and pistachio has also been reported. Current knowledge of the occurrence of Sesame seed allergy is limited but during the last decade sesame is an emerging cause of food anaphylaxis, due to the increasing use of the seeds/flour/oil in food products including food preparations for infants. This can explain the finding of sesame allergy even in extremely young infants. It varies according to the group of individuals studied and the country. In Australia the occurrence of allergy to sesame seed was estimated to be 0.42% among all children, while in the UK it was found to be 0.04% of adults. However the occurrence of allergy to sesame in patients with food allergy was found to be much higher than in the general population varying among the different countries studied, ranging from 0.5% in Switzerland to 8.5% in Australia. Recently, sesame was found to be a major cause of severe food allergic reactions among infants and young children in Israel. Sesame was found to be second only to cow’s milk as a cause of anaphylaxis. This was attributed to the early exposure in life and the heavy consumption of Sesame-containing foods in Israel. An increase in infantile eczema and anaphylaxis to food in Australia has been associated with sensitization to Sesame seed. The number of children sensitized to sesame seed was higher than the number sensitized to any one tree nut and this sensitization occurred early since 60% were under 24 months. To illustrate the issue an 11 months old infant developed facial swelling, hives, and wheeze when given his first taste of tahini, which his mother had consumed during pregnancy and lactation. A striking increase of cases of allergy to sesame has also been noted in France since 1993. The natural course of allergy to Sesame is not known but only 15% of children diagnosed at age 10-12 months outgrew their sesame allergy within 1 ½ - 2 years. Occupational allergy has also been seen in bakers preparing Sesame containing special breads and numerous other bakery products. It is speculated that since the use of Sesame seed/oil – containing products has spread through Europe and North America, probably due to the introduction of new trends such as vegetarianism, “health food” and exposure to exotic foods, a significant increase of recognized Sesame allergies including many anaphylactic reactions is likely to occur. A clinical history of allergy to Sesame seeds/flour/oil should be further investigated by skin prick testing (SPT) to commercial extract and/or crude sesame seeds, blood samples and oral provocation to Sesame seeds or oil. In small children “open” challenge can be used but otherwise challenges where the sesame is hidden should be used. Since the quality of the skin tests and blood samples are not sufficiently high it is almost always necessary to confirm the sesame allergy by a challenge. Patients diagnosed to have an allergy to sesame seeds/flour/oil should avoid all sesame–containing products. Although the stability of allergens is not known, sesame seeds are probably heat stable thus retaining their allergenicity after cooking. In addition sesame seed is a highly significant hidden allergen. Anaphylaxis to Sesame seed oil has been reported at a dose of 3 ml. It should be noted that Sesame oil is supplied in unrefined form and often is a hidden allergen, frequently labelled “vegetable” oil in a wide variety of products like margarine. Labelling of Sesame seeds and their products has been recommended by European Regulations. Patients therefore should try to identify food sources of sesame seed/flour/oil. Sesame sources reported to cause allergic reactions include: Sesame seeds, falafel vegetable burgers, white sauce containing Sesame, seed paste (tahini), salads containing Sesame seed oil, halvah, crackers, candy, hamburger on Sesame seed ban, bakery products, Sesame cake, Chinese food, appetizers, Turkish cake, breads. Cosmetics containing Sesame seed oil include lipsticks, moisturizing cream, and body oils. Finally inhalation of sesame seed dust can cause occupational respiratory allergy (asthma, hayfever) to sesame. Sesame seeds and products thereof are listed in annex IIIa of the EU directive on labelling of foods. Sesame (Sesamum indicum L) from different varieties produces yellow, white, red, brown, or black seeds http://www.hort.purdue.edu/newcrop/ncnu02/v5-153.html and http://www.hort.purdue.edu/newcrop/nexus/Sesamum_indicum_nex.html. The protein concentration is higher in white than brown seeds. Wolff et al (2003)  and Wolff et al. (2003)  report symptoms from two groups of 28 and 20 patients (34 in all) with cutaneous symptoms (urticaria and/or angioedema and/or exacerbation of atopic dermatitis) in 20/34, Gastrointestinal symptoms (diarrhoea, vomiting) in 5/34, respiratory symptoms (rhinitis, bronchospasm and/or asthma) in 6/34 and anaphylaxis in 5/34 patients. Cutaneous, gastrointestinal, respiratory symptoms and anaphylaxis (23 patients including some previously described). The mean age of the first allergic reaction was 11.7 months. Although the main clinical manifestation was urticaria/angioedema (n = 14, 60%), anaphylaxis was the presenting symptom in seven (30%) patients; all of them were younger than 1 year. Sixteen (70%) were found to be allergic to other foods, and other atopic diseases were identified in 18 (78%) patients. Three patients 'outgrew' their allergy within 1-2 years. (Dalal et al. 2003) . Cutaneous reactions (angiodema, and urticaria) were observed in 16/20 patients, rhinitis, rhinoconjunctivitis and oral or largyngeal in 5/20 patients, gastrointestinal symptoms in 8/20 patients and respiratory symptoms (2/20) (Beyer et al. 2002 ). Reactions included: anaphylaxis (6 patients), urticaria (4 patients), urticaria and angiodema (4 patients), gastrointestinal (1 patient) and urticaria and exacerbation of atopic eczema/dermatitis syndrome (1 patient) (Dalal et al. 2002) . Fremont et al. (2002)  report data on 6 patients of whom 3 showed symptoms of sesame allergy with one case of anaphylactic shock and 2 patients with atopic dermatitis and asthma who gave a positive result on challenge with sesame. Three others showed atopic dermatitis and 2 of these also had asthma but were negative on challenge but positive with SPT and RAST. Reactions included: angiodema and urticaria in 4/10 patients, glottis oedema in 3/10 patients, 1/10 with gastrointestinal symptoms, 1/10 asthma and 1/10 shock (Pastorello et al. 2001 ). Levy and Danon (2001)  report ten patients with cutaneous symptoms such as rash, pruritus and urticaria, angiedema, of whom two showed respiratory distress (one with cyanosis) and one had gasterointestinal symptoms . Pajno et al. (2000)  report gastrointestinal symptoms, itching, largyngeal oedema, anaphylaxis in a single patient. Asero et al. (1999)  report systematic urticaria, wheezing, largyngeal oedema, vomiting and abdominal pain followed by loss of consiousness in one patient about 5 minutes after eating sesame seeds. Stern & Wuthrich (1998)  report anaphylaxis in a single patient. Kolopp-Sarda et al (1997)  report a group of 7 sesame allergic patients (1 with baker's asthma, 1 showing atopic dermatitis and asthma, 2 showing angioedema, 2 showing anaphylactic shock and 1 laryngeal angioedema) and 5 with only sensitization to sesame. Kanny et al. (1996)  reported 9 patients showing urticaria, gasterointestinal symptoms, allergic rhinitis, asthma and anaphylaxis following ingestion of sesame or sesame oil. Kagi and Wuthrich (1993)  report anaphylaxis in a single patient. Chiu & Haydik (1991)  reported anaphylaxis induced by sesame oil in a single patient. Malish et al. (1981)  report anaphylaxis or angioedema and urticaria in 4 patients. Food/Type of allergen:Both commercial sesame extract and sesame seed freshly crushed and diluted in physiological saline (1:10 w/v) have been used. Protocol: (controls, definition of positive etc)Positive (histamine 1 mg/ml) and negative (50% glycerosaline) controls were applied. A wheal diameter of at least 3 mm larger than the negative control was considered positive (Dalal et al. 2003 ). Dalal et al. (2003)  tested 32 patients. Dalal et al. (2002)  tested 78 patients. Pastorello et al. (2001)  tested 10 patients. Levy and Danon (2001)  tested 10 patients. Asero et al. (1999)  tested a single patient. Kolopp-Sarda et al (1997)  tested 12 patients. Sporik and Hill (1996)  tested 2789 patients. Kanny et al. (1996)  tested 9 patients. Dalal et al. (2003)  found 30/32 positive results of which 23 were clinically relevant. Dalal et al. (2002)  found 16 positive SPT results (in three cases the SPT was negative with the commercial extract, but was positive with the extract from brown sesame seeds). Fremont et al. (2002)  found 6/6 patients SPT positive of which 3 were clinically relevant. Pastorello et al. (2001)  reported positive SPTs for 10/10 patients. Levy and Danon (2001)  reported 10/10 positive SPTs. Asero et al. (1999)  reported a 20X15 mm wheal with both fresh sesame and with an extract. Poppy seed caused a 10X10 mm wheal. Kolopp-Sarda et al (1997)  reported 9/12 positive SPTs. Sporik and Hill (1996)  found 531/2789 children sensitized to sesame. Kanny et al. (1996)  report 4 positive skin prick tests, one 1.5 mm wheal and 4 negative with commercial extract. All 6 patients tested with crude sesame were positive including the patients with 1.5 mm wheal and 3 who were negative to commercial extract. 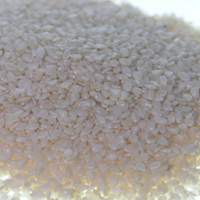 Commercial sesame seed extracts were used with the CAP systems. One method for making an extract for immunoblotting is given below. Sesame seeds were ground in a coffee grinder, followed by mortar and pestle, until a smooth paste was achieved. The paste was defatted by washing with at least 20 volumes (w/v) of cold acetone and dried overnight at 4°C. Dried acetone powder was stored at –80°C. Protein was extracted from the defatted, dried, powdered seed pulp by agitating with phosphate buffered saline and a protease inhibitor cocktail without EDTA (Roche) overnight at 4°C. After centrifugation at 2500g for 15 minutes at 4°C, supernatant was collected, filtered, and centrifuged at 12,000g for 3 minutes (Beyer et al. 2002 ). Detection of IgE specific to sesame seed protein extract, was performed with Pharmacia CAP System using a fluorocounter, according to the fluoroimmunological method (FEIA) described by Leimgruber et al. (1991)  with a commercial batch of sesame seed extract (Pharmacia) (Wolff et al. 2003 ). Antibodies to sesame were measured using the Phaebas CAP System (Pharmacia). Concentrations of ≥0.35 kUA/l were considered positive (Dalal et al. 2003 ). Dalal et al. (2003)  tested sera from 14 patients. Wolff et al. (2003)  tested sera from 28 patients diagnosed as allergic to sesame. Beyer et al. (2002)  tested sera from 20 patients. Fremont et al. (2002)  used sera from 6 sensitized patients, 3 with clinical symptoms. Pastorello et al. (2001)  tested sera from 10 patients. Asero et al. (1999)  tested sera from a single patient. Kolopp-Sarda et al (1997)  tested sera from 10 patients. Kanny et al. (1996)  tested sera from 8 patients. Alday et al. (1996)  tested sera from a patient with occupational asthma rather than food allergy. Dalal et al. 2003  found 12/14 patients had specific anti-sesame IgE (0.38-24.7 kU/L). All 14 were diagnosed as cases with IgE-mediated sesame allergy. Wolff et al. (2003)  found that sera from 3/28 patients were negative (< 0.35 kU/L) and 25/28 sera were positive (0.42->100 kU/L). Beyer et al. (2002)  found that the 10 sera had specific anti-sesame IgE (3.83 to >100 kU/L). Fremont et al. (2002)  found 15.4, 10.7 and 11.5 kU/L in patients reacting to sesame and 23.6, 7.74 and 1.03 kU/L in patients without symptoms clearly due to sesame. Pastorello et al. (2001)  found that the 10 sera had specific anti-sesame IgE (0.8 to >100 kU/L). Pajno et al. (2000)  reported that the total serum IgE was 22.3 kU/l but no specific anti-sesame IgE was detected. Asero et al. (1999)  report 29 kU/L sesame specific IgE by RAST. Kanny et al. (1996)  report that only 2/8 patients showed specific IgE to sesame with 13.2 kU/l and >100 kU/l. The total serum IgE was 14 - 1485 kU/l for the 5 sera tested. Wolff et al. (2003)  used 1D SDS–PAGE with a 6% stacking gel and 18% separation gel. Samples were heated to 100 °C for 10 min with SDS and beta-mercaptoethanol. Beyer et al. (2002)  used 1D and 2D separation. Samples for 2D separation were focussed on immobilized pH gradient strips with tributylphosphine and then modified by iodoacetamide before SDS-PAGE. Fremont et al. (2002)  used both 1D and 2D separation. 1D SDS–PAGE used either 4-20% gradient or 12% separation gels. Samples were heated to 100 °C for 5 min with SDS and beta-mercaptoethanol. Samples for 2D separation were focussed reduced by beta-mercaptoethanol with 3/10 ampholyte before SDS-PAGE on a 12% gel. Pastorello et al. (2001)  used 1D SDS–PAGE with a 6% stacking gel and 7.5-20% separation gel. Samples were heated to 100 °C for 5 min with SDS and beta-mercaptoethanol. Kolopp-Sarda et al (1997)  used 1D SDS–PAGE with a 10-15% gradient separation gel. Samples were reduced with beta-mercaptoethanol and SDS. Wolff et al. (2003)  electrophoretically transferred proteins to a nitrocellulose membrane. After blocking non-specific sites, the nitrocellulose membrane was washed, cut into strips and separately incubated overnight at 4 °C with each patient's serum (diluted 1:100). The membrane was then washed and incubated with anti-human IgE peroxidase conjugate (Sigma). IgE binding was located by incubation in SuperSignal West Pico chemiluminescent substrate working solution (Pierce, U.S.A.). Beyer et al. (2002)  transfered proteins to Immobilon-P membrane (Millipore) and then stained with Coomassie blue. 20 individual sera were added, diluted from 1:4 to 1:10. Phosphatase-labeled goat anti-human IgE was added and immunoblots were developed with 5-bromo-4-chloro-indolyl-phosphatase/nitroblue tetrazolium. Pastorello et al. (2001)  electrophoretically transferred proteins to a nitrocellulose membrane (Amersham Pharmacia Biotech). After blocking unoccupied protein binding sites, the nitrocellulose was then cut into strips, which were incubated overnight with each patient’s serum diluted 1:4. To reveal IgE binding to allergens, each strip was incubated for 6 h with 125I-labeled anti-human IgE antiserum (Pharmacia) diluted 1:5, followed by washing and exposure to X-ray film at −70°C for 5 days. Kolopp-Sarda et al (1997)  electrophoretically transferred proteins to a nylon membrane. The membrane was incubated for 30 minutes with the ten sera (diluted 1:100). The membrane was then washed, cut into 3 strips and incubated with goat anti-human IgG, IgA or IgE peroxidase conjugate (Dako). Binding was revealed by diaminobenzidine containing buffer. Wolff et al. (2003)  used sera from 24 of the 28 subjects with sesame-specific IgE. A 14 kDa protein belonging to the 2S albumin family (Ses i 2) was recognised by 22 of the 24 sera used. Beyer et al. (2002)  detected allergens of 7, 34, 45, and 78 kd by 2D-immunoblotting that were recognized by 30%, 60%, 75%, and 50% of the patients respectively. However, the 78 kDa protein only bound IgE weakly. The proteins were partially sequenced and identified as a 2S albumin, a seed maturation protein, a 7S globulin, and a homologue of an embryonic abundant protein from soybean (the 2S and 7S were named Ses i 2 and Ses i 3). Fremont et al. (2002)  report that 10 of 15 1D bands were recognized by anti-sesame IgE and that the results from all 6 patients, 3 with symptoms and 3 with positive RAST and SPT but without symptoms, were similar. Bands from 12.5-57.5 kDa were recognised with the strongest bands at 12, 22 and 23.5 kda. The bands at 32-36 kDa appeared weaker in the 1D gels. However, the 2D-gels showed 22/35 proteins binding IgE with the strongest binding between pH 5.5 and 6.0 and 32-36 kDa. Pastorello et al. (2001)  reported IgE binding to proteins of 9 kDa (10/10, 100%), 30 kDa (8/10, 80%), 14.4 kDa (7/10, 70%), 38.7 kDa and 43 kDa (6/10, 60%), 18 kDa and 53 kDa (5/10, 50%). Partial sequence of the 9 kDa allergen showed that it was a 2S albumin and this was named Ses i 1. Asero et al. (1999)  report intense IgE binding to sesame proteins at 10, 15-20 and 30-67 kDa. Less intense bands were present at 12 and 25 kDa. Poppy seed extract bound IgE at 12 kDa. Cross-inhibition showed complete cross-reactivity of the 10-12 kDa band. Kolopp-Sarda et al (1997)  report the detection of anti-sesame IgG, IgA and IgE. 1/12 patients had IgE to a 14 kD, 6/12 to a 25 kD and 2/12 to a 30 kD allergen. IgG and IgA antibodies recognized more bands. In all 8/10 samples tested for IgE recognized sesame. Alday et al. (1996)  reported IgE binding to a 14 kDa allergen, with weaker binding if the allergen was reduced. Morisset et al. (2003)  used stewed apples or mashed potatoes as placebo and dried biscuit powder was included to simulate crushed sesame seeds. The doses of crushed sesame seed were gradually increased from 5 to 5000 mg for solid food. Doses of sesame oil were from 1 to 30 mL. Dalal et al. (2003)  - Oral challenge was used only in cases where the required combination of the strict clinical criteria together with positive SPT was not diagnostic. In two cases, an open oral challenge with incremental doses of Halva (a sesame-based confection) was performed at 20-min intervals, up to a total dose of 20 g. This was done in a hospital set-up unit, which is fully equipped for cases of anaphylaxis. The patients were observed closely during the challenge and 2 h afterwards. Fremont et al. (2002)  used crushed sesame hidden in mashed potatoes. Placebo potatoes contained crushed crumb. Pajno et al. (2000)  A double blind, placebo controlled food challenge (DBPCFC) was carried out in the outpatient clinic with full facilities for resuscitation. The challenge was performed with sesame seeds (5 g) masked in bread. The placebo bread was baked with hazelnut (5 g). Kanny et al. (1996)  used sesame seed flour mixed in apple compote or puree. Rice flour was used for the placebo. Doses were 5 mg, 10 mg., 50 mg., 200 mg. in 30 g. of apple (or potato) on the first day. If no adverse reaction had occurred, doses of 0.5 g, 1.5 g and 5 g were given and 10 g. in 3 cases on day 2. Morisset et al. (2003)  and Pajno et al. (2000)  were blind. Dalal et al. (2003) was open. Kanny et al. (1996)  were double or single blind. Number of Patients:From 1 patient (Pajno et al., 2000 ) to 12 patients (Morisset et al., 2003 ). The lowest reactive threshold was observed at 30 mg of sesame seed. A cumulative reactive dose inferior or equal to 65 mg of solid food characterized 8% of sesame allergy (Morisset et al., 2003 ). Positive reactions were observed at 100 mg. (and 3 mls sesame oil in the same patient), 3 patients at 7 g. (one tested but negative for sesame oil) and 3 positive at 10 g.
Morisset et al. (2003) -Haemodynamic modifications were observed in 8% of the oral challenges (OCs) to sesame. Respiratory symptoms were observed in 42% of sesame allergies. Dalal et al. (2003) - The main clinical manifestation was urticaria/angiedema , and anaphylaxis was the presenting symptom in seven patients; all of them were younger than 1 year. Fremont et al. (2002)  report that 2/3 patients gave positive DBPCFC. Pajno et al. (2000) - About 15 min after the patient ate a small amount of sesame bread, generalized flushing and hives, abdominal pain, cough, and dyspnea appeared. She was promptly treated with subcutaneous epinephrine, intravenous corticosteroids, and intramuscular antihistamine, and the symptoms disappeared within 1 h. At the onset of symptoms, the FEV1 fell to 61% of the predicted value and returned to normal values after inhaled salbutamol and the above mentioned therapy. No increase in serum tryptase was observed (12.4 µg/ml, normal range 4.8-13.5 µg/ml). Kanny et al. (1996)  report urticaria and itching with 100 mg. of sesame and urticaria with sesame oil; the responses at 7 g were urticaria, urticaria with itching and abdominal pain followed by conjunctivitis and eczema in 3 patients; the responses at 10 g were skin rash and asthma, abdominal pain followed by malaise and dyspnea, and anaphylactic shock in 3 patients. There was a negative challenge at 7 g.
Vocks et al. (1993)  - Allergy to kiwi, poppy seeds, and/or sesame seeds often occurs in patients with a simultaneous sensitization to nuts and flour (including rye). Previously cross reactions have been verified by RAST inhibition. In this study the nature of this cross-reactivity is further characterized by sodium dodecyl sulfate polyacrylamide gel electrophoresis (SDS-PAGE), followed by immunoblotting onto nitrocellulose. The degree of cross-reactivity among kiwi, sesame seeds, poppy seeds, hazelnuts, and rye grain was found to be very high in the patients studied. The existence of both cross-reacting and unique components was observed; however, the cross-reacting and unique components could be different for different patients. Gloor et al. (1995)  and Asero et al. (1999)  note that poppy seed allergic patients cross react with sesame. Pajno et al. (2000)  from a DBPCFC result suggest that sesame can cause non-IgE mediated anaphylaxis. This may also be suggested by Eberlein-Konig et al. (1995) , Kolopp-Sarda et al (1997)  and Stern & Wüthrich (1998) . However, it is possible that sesame allergens are missing from the extracts used for SPT or CAP/RAST and Kanny et al. (1996)  found better results by prick-prick compared to the use of commercial extracts. The sesame allergenic activity survived baking. Chiu & Haydik (1991)  and Kanny et al. (1996)  have reported severe reactions from sesame oil. As sesame oil is used for flavouring it is generally not refined and thus is more allergenic than other oils. However, Asero et al. (1998)  note that oil is less allergenic than seeds. Kanny et al. (1996)  review the reports of seame allergy (1950 - 1996) and list some foods containing sesame seed or sesame oil. Several authors stress that sesame allergy is not uniformly geographically distributed (Dalal et al. 2002 ). The abstract of Kimura (2001)  suggests that sesame may be an important allergen in Japan. The studies of Dalal et al. 2002 , Dalal et al. 2003  and Wolff et al. (2003)  included some common patients. Besler M, Hefle SL, Jensen-Jarolim E.
Sensitization and allergy to sesame seed. A clinical and biological study of 4 cases. Identification of sesame seed allergens by 2-dimensional proteomics and Edman sequencing: Seed storage proteins as common food allergens. Allergy to sesame in humans associated primarily with IgE antibody to a 14 kDa 2S albumin precursor. Pajno GB, Passalacqua G, Magazzu G, Barberio G, Vita D, Canonica GW. Falafel burger anaphylaxis due to sesame seed allergy. Malish D, Glovsky MM, Hoffman DR, Ghekiere L, Hawkins JM. Anaphylaxis after sesame seed ingestion. The major allergen of sesame seeds (Sesamum indicum) is a 2S albumin. Allergy to peanut, nuts, and sesame seed in Australian children. Fremont S, Zitouni N, Kanny G, Veneri V, Metche M, Moneret-Vautrin DA, Nicolas JP. Allergenicity of some isoforms of white sesame proteins. Leimgruber A, Mosimann B, Claeys M, Seppey M, Jaccard Y, Aubert V, Peitrequin R, Nisoli MP, Pecoud A. Clinical evaluation of a new in-vitro assay for specific IgE, the immuno CAP system. Eberlein-Konig B, Rueff F, Przybilla B.
Generalized urticaria caused by sesame seeds with negative prick test results and without demonstrable specific IgE antibodies. Alday E, Curiel G, Lopez-Gil MJ, Carreno D, Moneo I. Occupational hypersensitivity to sesame seeds. Wolff N, Yannai S, Karin N, Levy Y, Reifen R, Dalal I, Cogan U. Identification and characterization of linear B-cell epitopes of beta-globulin, a major allergen of sesame seeds. Kanny G, De Hauteclocque C, Moneret-Vautrin DA. Sesame seed and sesame seed oil contain masked allergens of growing importance. Identified using proteomics from the peptides IDILVNNAAEQYEASTVEEIDEPR and VVEEVVNNYGR which are homologous to sequences of glucose and ribitol dehydrogenases from soybean. The sequence belongs to the short-chain dehydrogenase family which includes dormancy related proteins from Arabidopsis. Nature of main cross-reacting proteins:Asero et al. (1999)  report cross ractivity of the 10-12 kDa bands between sesame and poppy seed, suggesting that either Ses i 1 or Ses i 2 cross reacts with a 2S albumin from poppy seed. Allergen properties & biological function:Ses i 1 is a 2S seed storage protein. Allergen purification:Sesame seeds were crushed and diluted in 0.1M phosphate buffered saline (pH 7). The extract was centrifuged and the supernatant (8.14 mg/ml) was gel filtered on Superdex 75 with 0.035 M phosphate and 1M NaCl. Fractions near 9 kDa were pooled and concentrated. The precursors of the 2S albumin allergens Ses i 1 and Ses i 2 have only 56/153 identical residues (36%). Molecular cloning of 11S globulin and 2S albumin, the two major seed storage proteins in sesame. Allergen epitopes:Wolff et al. (2004)  reported that the sequences WESRQCQMRHCMQWMRSMRG (residues 44-63), QYEESFLRSAEANQGQFEHFREC (residues 64-86) and EANQGQFEHFRECCNELRDVK (residues 74-94) bound IgE from 16/20, 18/20 and 10/20 sera respectively. Shorter peptides were then tested against 15 sera and SRQCQMRHCM (residues 46-55), QCQMRHCMQW (residues 48-57), NQGQFEHFREC (residues 76-86), GQFEHFRECC (residues 78-87) and HFRECCNEIR (residues 82-91) were recognised by IgE from 14, 14, 14, 6 and 6/15 sera respectively. Process, chemical, enzymatic:Not known but the disulphide cross-linked structure is expected to be stable. Allergen properties & biological function:Ses i 2 is a 2S seed storage protein. It is rich in sulphur containing aminoacids. Allergen purification:Raw sesame extract was separated on a Hiload 26/60 Superdex 200 FPLC (fast-performance liquid chromatography) column (Pharmacia) by size-exclusion chromatography. The column was equilibrated and eluted with 100 mM NaCl solution in 50 mM Tris solution, pH 7, at a flow rate of 2.5 ml/min. The absorbance was monitored at 280 nm. Fractions were subjected to SDS\ZPAGE and those showed protein bands were subjected to Western blotting. Fractions giving positive reaction in the Western blotting test were loaded on a reversed-phase, C8 HPLC column in 0.1% trifluoroacetic acid (TFA). Elution was carried out using a linear gradient of 4 to 100% acetonitrile (ACN). Fractions corresponding to chromatogram peaks were collected and proteins in the different fractions were analysed by a dot blot test using sera of subjects that gave positive results in the Western blot (Wolff et al. 2003 ). Other biochemical information:The precursors of the 2S albumin allergens Ses i 1 and Ses i 2 have only 56/153 identical residues. The peptides from Wolff et al. (2003)  match Q9XHP1 as does the shorter peptide from Beyer et al. (2002) . The major allergen was separated by gel filtration chromatography and identified by selective proteolysis followed by peptide sequence analyses, employing electrospray-ionization mass spectrometer. Process, chemical, enzymatic:Not known. However, many 7S globulin storage proteins are rather stable to heating.